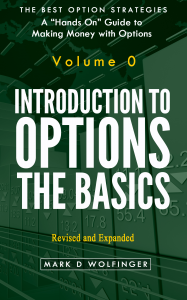 Introduction to Options: The Basics has been revised and updated. It remains a very basic introduction to options, but now it has even more useful material. The book is still free, and you can download it or get it from your favorite online bookseller. NOTE: DO not pay $0.99 at amazon.com. It is free everywhere — except at amazon.